Love. It brings them back from the edge of death, from what I have heard. It makes them whole again. Songs and poetry were rife with testimonials to its healing power. But the Emperor seems to be beyond its reach; he has no interest at all in any of the harem women – says his “old man” is as limp as a drowned snake. Who, then? What woman is going to come and work this miracle and wake him up before it is too late? Kao Li-shih was interrupted by Lu Pei quietly opening the door and entering the room. In the moment that his eyes met the apprentice’s, inspiration hit. “Grand Verity,” he said aloud. “Pardon me?” said Lu Pei politely as he shut the door behind him. 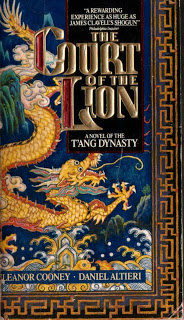 I can’t recommend The Court of the Lion enthusiastically enough – it’s got everything a great big fat historical novel should have, in even greater helpings than most of these dozen books are lucky enough to have.